Your first paragraph states “multiplications which are themselves slower than divisions”, but surely you meant the opposite. Yes. Thank you, I fixed that. Looks like it’s worth to try to implement in the compilers. All numbers in JS are floats under the hood so the raw bits are not going to act the same as ints. That’s probably why the function isn’t working as is in pure JS. Great article and paper! Small typo: “This approach was known Jacobsohn in 1973” should be “This approach was known TO Jacobsohn in 1973”. I fixed the typo, thanks. Coincidentally, in September 2018 a slightly extended version of divisibility check shown in Hacker’s Delight was implemented in GCC (so it doesn’t appear in gcc-8, but will be available in gcc-9). Some discussion can be found in GCC PR 82853, and you can see the optimization in action on Compiler Explorer. All well and good, iff one doesn’t need the quotient [unless I missed something]. Please, have you also tried it with 64-bits “n”, as it would need 192-bits intermediate computation (if I understood correctly)? Can yo perhaps share some timings as well, in addition to the 32-bits case? PS: Intel’s Cannon Lake is supposed to have 10-18 cycles latency for integer division, could make for interesting comparison! Please, have you also tried it with 64-bits â€œnâ€, as it would need 192-bits intermediate computation (if I understood correctly)? Can yo perhaps share some timings as well, in addition to the 32-bits case? You do not need 192-bit intermediate computations, 128-bit is enough. However, the engineering gets more complicated if you are to deal with overflows properly. We are inviting people to pursue the research. We do not claim to have written the last word on this. If you are interested in pursuing the research and want to chat, do get in touch with us. Intel’s Cannon Lake is supposed to have 10-18 cycles latency for integer division, could make for interesting comparison! Of course, these fizzbuzz tests do not use the division instruction. The division instruction would be slower. However, it would be less terrible than on skylake processors. I’ve added support for 64-bit unsigned modulo in a fork here (https://github.com/dnbaker/fastmod/tree/fastmod64). You’re right that 192- (or 256-) bit integers aren’t needed; all you need to do is make sure you handle overflows correctly. I’m not saying that this is optimal code, but it does appear to pass the expanded unit tests. Of course, division and support for signed integers would be desirable as well, but for my purposes, a fast 64-bit mod is all I need. Interesting. I will have to have a look at it. It’s lookd like this could be quite useful in the cases that applies! For example this libdivide issue could be finally updated (looks like someone got to it since I first ran across it). They paper could be clearer though that it only applies (for real ALU sizes) to an N/2-bit division on an N-bit machine. Usually you want an N-bit division on an N-bit machine, and that’s what the competing approaches offer. This means that on a (typical) 32-bit machine only 16-divisors are supported, and on 64-bit only 32-bit divisors are supported. On machines like most x86 where 32-bit and 64-bit multiplications have the same cost, this can still be useful when you are dealing with narrower-than-machine-word things as your uint32_t benchmarks show. This need for double-width multiplications isn’t just indidental: the main speedup is by avoiding the rounding corrections which are required in the quotient approaches: by doubling the width of the operations you avoid the need for rounding. The mathematics can be presented as an extension of GM’s approach, and it is just as general. A commenter on this blog post has reported an application of the mathematical result to 64-bit unsigned division on 64-bit processors. An additional insight is that you can avoid the extra work related to avoiding overflows by just using wider registers. I have more ideas regarding other applications of the mathematical results (that have nothing to do with 32-bit/64-bit registers)… but I don’t have time right now to pursue it so it will have to wait. it is just as general. The basic mathematics is general, yes â€” I think everyone agrees that the remainder can be calculated as frac(n / d) * d and in the abstract that’s just as general as n - trunc(n / d) * d.
However, the earlier work (and this one) primarily focus on the efficient implementation of these methods on real hardware. That’s the interesting part, if I’m not mistaken? In that domain, the general target is to implement W-bit division on W-bit machines, and a large amount of the complexity in analysis and much of the runtime cost comes as a result of the difficulty of doing that. So if you are going to implement only W-bit operations assuming that your machine can do 2W-bit arithmetic, I would certainly consider that less general – and comparing W-bit approaches against 2W-bit approaches doesn’t shed much light on the performance of the underlying techniques since it mixes the two effects together. In fact, I claim that the majority of the improvement in the assembly you show is due to the use of the wider operations and more precise reciprocal, rather than the more “direct” calculation method. 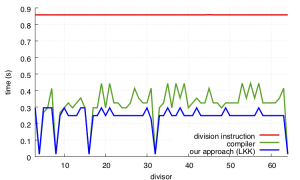 mathematical result to 64-bit unsigned division on 64-bit processors. I didn’t look at it, but if it were true – and it was as efficient as the narrow-input case you illustrate – then my point is basically moot (although it of course still applies to the paper itself, which doesn’t mention this). That’s the interesting part, if I’m not mistaken? I cannot dictate what is important or interesting to you. But maybe you agree that more than one thing can be interesting at once. As far as we know, nobody worked out the mathematics for the direct computation of the remainder. Authors simply ignored the issue. Completing the mathematical framework was important, I think. A direct application of this “new math” is the divisibility test which I think is really nice. In fact, I claim that the majority of the improvement in the assembly you show is due to the use of the wider operations and more precise reciprocal, rather than the more â€œdirectâ€ calculation method. It might be. It is certainly worth exploring. 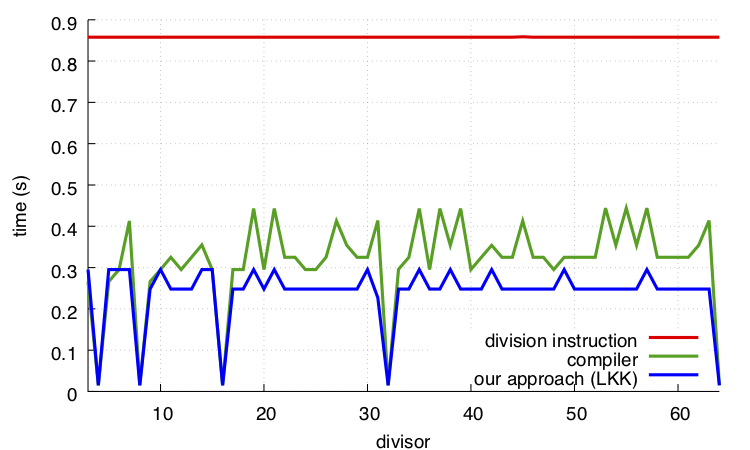 We published our benchmarking code (see link above) and we include in these benchmarks an approach that computes the remainder with a fast “wide” division to get the quotient first. It was often faster than other alternatives, but also generally slower than the direct approach. That does not contradict your “majority” claim… but few people are interested in the second-best approach when the best approach is no more expensive. Because it was unexciting, it is not reported in the published paper even if it appears in our logs and public code. you agree that more than one thing can be interesting at once. computation of the remainder. Authors simply ignored the issue. Completing the mathematical framework was important, I think. Yes, I did not mean to imply that the mathematics weren’t important. What I mean is that at a high level what makes this whole thing interesting (to me, to you, to almost everyone, I think) in the first place is that it is potentially more efficient than any existing approach. Once that is established, then the math becomes very important indeed to establish the correctness and to understand the limits. It is a good point. I haven’t considered the divisibility test aspect of this or evaluated competing approaches. but few people are interested in the second-best approach when the best approach is no more expensive. That seems strange to me, I would expect the second best approach (i.e., the best existing approach) to be the most important baseline so you can report an improvement over the best existing approach. Or do you mean that this second-best approach is also new? Assuming it’s just a 32-bit division using a 64-bit reciprocal, I don’t think that is right: it is well-known that using a large enough reciprocal removes all rounding errors and hence speeds things up – IIRC the needed number of bits is W + log(d) just like the new direct remainder calculation. Almost every treatment of the topic explains that if you have an X-bit reciprocal, the result is exact, and then go on to handle the harder case where W < X and so you need extra steps to get the exact result, because people do really want W-bit math on W-bit machines. Yeah, compilers (and libdivide?) don’t seem to take advantage of this special case, but that’s not news: there are a lot of “narrow word” tricks they don’t implement (and some they do, they seem to have been added over time as special cases). So for me, the observation with the biggest impact is that compilers and libdivide should special case 32-bit division on 64-bit platforms (where 64-bit multiplication is as fast as 32-bit at least, and the handling of 64-bit constants isn’t too onerous) by using a finer-precision reciprocal approximation that produces an exact result. This applies to division as well, not just remainder, so it has wide applicability. The most extensive empirical justification I know of for this improvement is hidden in a paper talking about “faster remainders via direct computation” though! Compilers and libdivide should of course also consider using this new faster remainder algo when only remainder is needed and the inputs are narrower than the word size (that said, I think you can extend your algorithm to work generally for W-bit divisions on W-bit hardware, using the same types of rounding tricks as division uses – that would certainly give a boost to likelihood of integration, I think). They should also use the divisibility check (although again I didn’t really evaluate this part). I have written a follow-up blog post: More fun with fast remainders when the divisor is a constant where I try to elaborate a bit more on the issues. I’m also curious if there are any newer results on floating point remainder (for my application specifically, a floating point numerator and integer divisor). We have not looked at the "mathematical modulo", but it is probably not too difficult. Floating point remainders are probably another story entirely. Great. If I ever get time, I’ll take a look at that with your paper as inspiration. Current implementations seem very slow, either using branching or two modulo operations.